During the Florida Hospice & Palliative Care Association (FHPCA) Forum 2018, which took place May 31 through June 1, Haven was recognized with three Awards of Excellence including the Excellence in Program Innovation Award, the Hospice Story Award and the Excellence in Clinical Practice Award. Haven won the Excellence in Program Innovation Award, which recognizes services and programs provided by a hospice organization that demonstrate the power of creativity and ingenuity to impact the practice and the community, for its Haven Legacy Project. The services provided by the Haven Legacy Project are impactful tools to help families in their bereavement journey. Those services include hand photography, life reviews which can take the form of video, written narratives based on interviews with patients and their families, drawings or a combination of these elements provided at no cost to family members. The award also recognized Haven Volunteer Joyce Pearson for her integral work with the program. 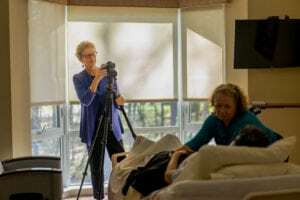 Haven and volunteer Elizabeth Lowe, PhD were selected for the Hospice Story Award, which is given to the person or organization that best captures his or her most meaningful hospice experience with an original creative work. Elizabeth worked with a young mother who was a hospice patient and struggling to find a way to explain her advanced illness to her 7-year-old son by helping her to write a story called The Little Dinosaur Goes on an Adventure. The story encouraged the son to accept his new home with the patient’s sister. Elizabeth is a university professor specializing in languages, cultures and literatures. The Excellence in Clinical Practice Award was given to Haven Chaplain Rev. Donna Carlile, M.Div., who has since been promoted to Counseling Services Manager. An advocate for patients and families, a resource to multiple community organizations, and a public speaker and educator regarding dignity in patient-centered care, Donna, promotes the advancement of excellence in hospice and palliative care. 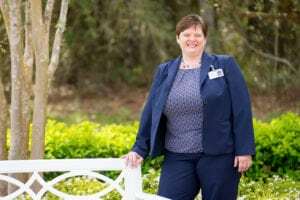 Donna was recognized for being generous with her personal time and going above and beyond her job responsibilities to provide comfort, care and compassion to patients, families and fellow Haven associates, especially in unique and emotionally-charged situations.